The Boundless Thicket: What Should I Be Eating? I have always enjoyed working out and doing my best to eat healthy and stay in shape. One day while reading on Glamour magazine’s website I came across an article discussing what you should eat pre-work out. 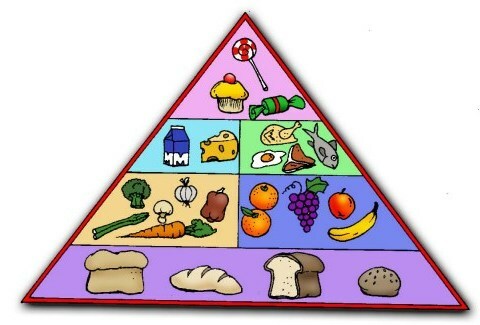 What to eat had always confused me because I always heard different things. Some people say you should not eat and you will burn more calories. Other people say you should eat a lot of protein. Once I came across this article I started to read more. The article supported the fact that not only does it depend on what you eat, but also when you eat it. It also supported the fact that you should not eat straight carbohydrates; instead you should eat a mixture of protein and carbohydrates. While this information was interesting, was this a trusted source? Also, this made me think even more: why are there certain types of food that you should be eating and what do they do for the body? 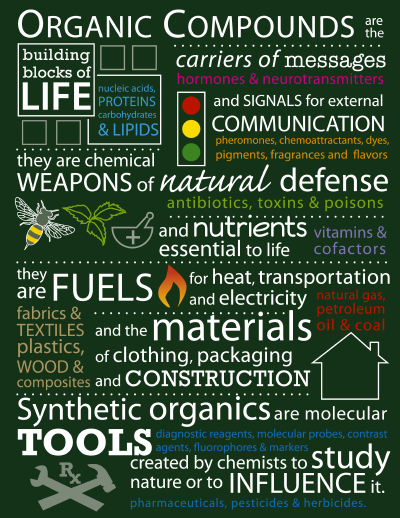 What is in them that give you benefits over other foods? Also, what should you be eating post-exercise? I began searching further and used Google Scholar because I figured it would lead me to trustworthy information. I found an article entitled “The Importance of Glycogen for ATP Resynthesis Before, During, and After Physical Activity.” It discussed different ways energy is stored and burned and why certain foods are better for you. I never thought that the food I ate would deal directly with organic chemistry, but in fact it does. The metabolic pathway is the essential pathway that deals with the way food is broken down and the energy sources we get out of them. In fact the body will break down carbohydrates, fats, and proteins in all different ways and get different amounts of ATP out of them. I found that what foods are eaten pre- and post-workout play an essential role in our muscles work. Muscle contractions are the main element to a workout, and it is calcium that allows a muscle contraction to generate. Without calcium there can be no contraction and without additional ATP, which is generated during the contraction, muscles will not be able to contract any further. This is because actin and myosin will be stuck until more ATP can bind to them. This would cause a problem during exercise. If muscles were stuck in a contraction then it would be impossible to relax, which would be very dangerous during post workout. The JMOL image shows the myosin domain that calcium will bind to in order for muscles to contract. While this information was helpful to know, I still did not understand what it was about certain foods that gave them exercise related benefits. Perhaps they could have different benefits that were unrelated to energy. I continued to read because while I have learned about ATP in many of my classes, I never fully understood why it was related to exercise. ATP can be generated through a process called glycogenolysis, which breaks down glycogen in the muscles. It is glycolysis that increases the rate of ATP resynthesis. Glycolysis has always been a scary word to me because everyone always says that you have to memorize the pathway for Biochemistry. I am in Biochemistry now, and we will be learning the process of glycolysis soon. We also had learned a brief overview of the metabolic pathway in Anatomy and Physiology. I guess there is a reason for why all of these processes are so important because without them the body would not be able to function. I learned that glycolysis is used during exercise as a way to increase the amount of pyruvate for oxidation. As you increase the intensity of the workout, more oxygen is supplied to the muscles and the mitochondrion becomes more efficient. However, eventually fatigue occurs because not all cells receive oxygen and the pyruvate turns into lactic acid. When lactic acid is produced, it reduces the rate at which glycogen is being broken down. The sketch below shows the reaction scheme of turning pyruvate into lactic acid. The enzyme lactate dehydrogenase is used while spending a molecule of NADH. While all of this information was expanding my knowledge, I wanted to get down to the bottom of which foods are the best for you. The ways in which carbohydrates, proteins, and fats are broken down have different pathways. Carbohydrates are broken down through glycolysis, the Citric Acid Cycle, the electron transport chain, and eventually oxidative phosphorylation. Overall, a typical carbohydrate like glucose gives a net total of 38 ATP, when broken down. A process called lipolysis breaks down fats. These fatty acids then enter the Citric Acid Cycle and go through oxidative phosphorylation. However compared to carbohydrate catabolism, a fat molecule can make over 300 ATP. Although this is a tremendous amount of ATP, the overall process is very slow so the body will choose to use glucose from carbohydrate catabolism during intense exercise. This is because it creates ATP faster and can keep up with the demand needed during exercise. Then there is protein catabolism. I learned that this process is usually never used in order to generate ATP, unless under conditions of starvation. This is because it is an inefficient process and generates less ATP than carbohydrates. So when it comes to fuel to generate biomechanical energy, a high carbohydrate diet, pre-workout, will increase exercise performance because it increases glycogen storages. Greater amounts of glycogen storage will allow the body to create more energy, resulting in a longer lasting performance. In the sketch below, glucose is shown to contain only C, H, and O elements. While this article was insightful, I still wanted to know more. I had found one answer to my question and now I would hopefully find information on the post workout. I wanted to find data to actually support the information I was finding. While I did more research, I found a study done on carbohydrates and proteins post work out. The study I found was from Journal of Applied Physiology and was entitled, “Early postexercise muscle glycogen recovery is enhanced with a carbohydrate-protein supplement.” Again I figured this would be trustworthy because it came from a peer-reviewed journal. As learned from the previous article, glycogen storage is the source of energy needed for intense workouts. Once depleted, the body will fatigue until the sources have been regained. This experiment tested how fast glycogen stores can be replenished with the proper foods. The actual experiment was very interesting. The subjects were seven trained male cyclists that were all around the same age, height, and weight. All base line vitals were taken initially. Experimenters had to test original glycogen levels and to do this they used a C-NMR scan. The cyclists then exercised doing sprints and cycling. After 10 minutes post recovery they were given two nutritional supplements. Again, levels were measured using a C-NMR scan. After 120 minutes post recovery, they were given another nutritional supplement and data was recorded. After 240 minutes post-recovery the cyclists were given a mixed meal. This same procedure was done three times using three different supplements. The three different supplements were CHO-Pro, which was the carbohydrate and protein supplement. HCHO, which contained carbohydrate and fat, and LCHO, which also contained carbohydrate and fat. 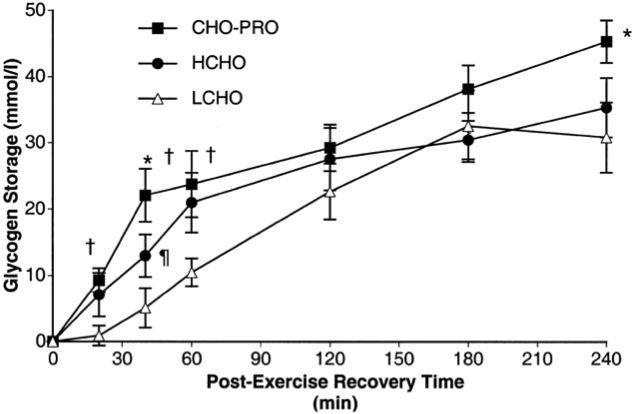 While CHO-Pro and HCHO had the same calorie content, LCHO had fewer calories in it. This was important to test because researchers could believe that it may just be the amount of calorie intake that could affect glycogen storages. The results of this experiment proved very interesting. In fact, there was no significant change in muscle glycogen concentrations between the three supplements before or immediately after exercise. However, it was after four hours of post workout recovery that the CHO-Pro showed significant results. The total glycogen storage was greatly increased in the carbohydrate and protein supplement compared to the other two. From the chart below, it can be seen how glycogen storage levels increased post-workout for the carbohydrate-proteins supplement, while the other two remained similar in numbers. The * represents that there is a significant difference in CHO-Pro compared to LCHO and HCHO. The † again represents that was a significant difference from CHO-Pro and LCHO. The ¶ represents a difference from HCHO and LCHO. 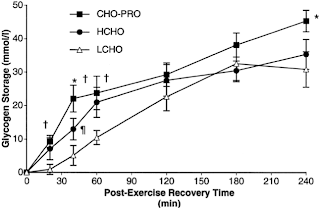 Patterns of muscle glycogen storage during recovery as determined by nuclear magnetic resonance spectroscopy for the carbohydrate-protein (CHO-Pro; ■), isocarbohydrate (LCHO; ▵), and isocaloric carbohydrate (HCHO; ●) supplements. Overall from this experiment, it can be concluded that the carbohydrate-protein supplement restores muscle glycogen concentrations to a greater degree than the pure carbohydrate supplements. Therefore, I guess Glamour magazine was right in some sense. Although carbohydrates are best before a workout because they increase glycogen storage, post workout a carbohydrate-protein mixture will help you recover best. These foods could range from yogurt with fruit or an apple with some nuts. Next time I go for a run I will be sure to eat a healthy meal full of carbohydrates so that I have more glycogen stored and I can workout out for longer and more intensely. I will then eat a mixture of carbohydrates and protein post workout so that my storage levels return to normal. Now it’s time to try! You stated that it is important for foods to be eaten pre and post work outs, are there any specific foods that should not be eaten? Would it be better to eat a small snack or an entire meal? I use to eat before I worked out but would always catch a cramp while running but after reading this I suppose it will be best to go back to eating first. Great article! I found your post very interesting and something that many college students could benefit from reading. Like you mentioned, I too was always uncertain as to whether or not it is beneficial to eat before working out. I am starting to train for my first half marathon, so reading your blog post has been helpful. I was previously under the impression that post-workout snacks could be carbohydrates alone, but I now realize that a combination of protein and carbohydrates is the best way to return glycogen storage levels to normal. I am now eager to read more information specific to long-distance runners. The title of this article specifically caught my attention because I am a Kinesiology major and have learned a great deal about this topic. I liked how your article simplified the information. However, it might be useful to look at more articles to get more information. There is something called the crossover effect that happens during exercise when the body goes from utilizing glucose to utilizing fat as a main energy source because glycogen stores are running low. The nutrient used also depends on exercise duration and intensity which would be useful to mention in your article. Do you think different different type of workouts have any effect on which energy source is utilized? I read this article because I am a fitness and nutrition hobbyist. I liked how the information was made very simple and accessible to a wide range of readers (beginners or educated scientists). I also liked that you included fat in the mix with your research findings, as in many of the articles I have read the authors focus exclusively on protein and/or carbohydrates. A related topic that I am very interested in that you might find interesting to check out is looking at the other non macro nutrient compounds that affect exercise performance and recovery. I have seen many other articles about different phytochemicals or nutrient metabolites that act in different ways to improve performance and recovery in an exercise setting. For instance, there is actually some truth to the whole Popeye's big muscles and spinach folklore. Nice work on this though, it was well done.